Did You See the Eclipse? I Did! This is the second solar eclipse I’ve seen in six years. The last one was in Japan, and it was a total eclipse. This time, we had a partial eclipse here in Edmonton. I made a solar eclipse viewer with a cereal box, and it performed wonderfully. Curious to see the results? Well, check it out! I could see clouds when they passed over the sun. While the image was sharp, the camera found it to be difficult to focus on it, mainly because of the contrast between the dark box and bright light of the eclipse. It got darker. It was still sunny, but it was a very odd sunny. It was like we had a 70% less bright sun. Things that I normally would have squinted at, like the white garage door, was no longer very bright. It became cooler. It was a significant drop in temperature, and I wanted to wear a jacket. It was a 25 C day. That’s warm. But with 70% of the sun covered, the heat was less, and it felt cool. I would have loved to have experienced the total eclipse. When I was in Japan, it was cloudy. I didn’t notice much of a cooling and while it did become significantly darker, it was still cloudy, and it wasn’t as impressive. I could still see the eclipse through the clouds, though. And yes, I did look at it without protecting my eyes with glasses. I couldn’t see it with the glasses, actually! The clouds were just the right thickness to be able to see the eclipse. But don’t worry, I only glanced at it quickly. And then when there was a break in the clouds, I used the glasses and took pictures through them. Did you see the eclipse? Let me know! Most of you are from North America, and I’m sure you know about the solar eclipse next Monday, right? The path of totality will cross the United States, but all of North America will get to see it to varying degrees of partiality. For me, it’ll be around 75% partial. 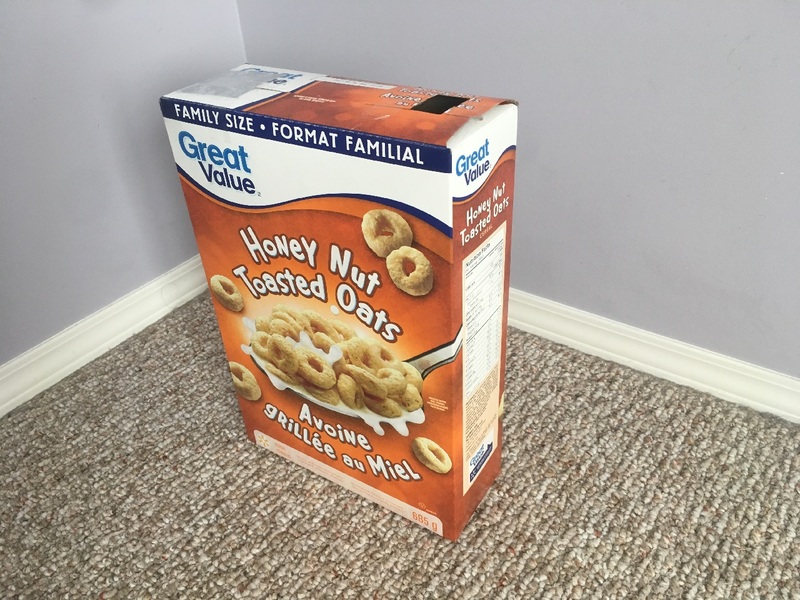 An easy to make solar eclipse viewer made with a cereal box. That’s right, it’s a cereal box. Curious how to make it? It’s actually very easy. I made a video showing how I made it, so if you want to try this out, then definitely watch the video! Are you going to make it? Any kind of cereal box will do. You can use pretty much any kind of box, actually. Just make sure no light is getting in except through the pinhole. Let me know if you’re going to make it! Even though the A to Z Challenge is over, and I took a huge break, I’m going to finish it. A lot has happened over the last couple months, but it’s back! Today is the letter E, and I’m talking about Jupiter’s moon Europa! Did you learn anything new? Europa is the fourth largest natural satellite of Jupiter. It was discovered in 1610 by Galileo Galilei, along with the other three Galilean satellites. The surface of Europa is the smoothest surface of any world in the Solar System, consisting of water ice. Europa orbits Jupiter in just 3.55 days, with one side always facing Jupiter, as it’s tidally locked. Beneath the ice crust is an estimated 100 km deep ocean of salt water. But it isn’t clear if the ice is thick or thin. However, the amount of water on Europa is about two to three times the volume of Earth’s oceans. Europa has a weak magnetic field, best explained by Europa’s salt water ocean. Tidal heating from the interactions of Europa with Jupiter and the other Galilean satellites warms the interior of the moon, possibly resulting in hydrothermal vents at the floor of the ocean. This has led scientists to suggest that life may exist in Europa’s ocean. Europa most likely has an iron core and a rocky mantle. Observations by the Hubble Space Telescope provide further evidence of subsurface oceans, as plumes of water have been seen erupting to 200 km above the surface. Europa has an oxygen atmosphere. But it’s very thin, providing a surface pressure of only 0.1 micropascals. Let me know what you learned in the comments section below! Here it is! It’s the Blogging from A to Z April Challenge! Two years ago, I participated in it, and now I’m doing it again. This time, I have a science theme, and I am featuring videos. For the first topic, we have Alpha Centauri. Check out the video below. After the video, the facts are available for you to read. It’s a triple star system 4.37 ly from the sun. Alpha Centauri A is also known as Rigil Kentaurus, while Alpha Centauri C is known as Proxima Centauri. B has no other name. Alpha Centauri A is a G2 yellow dwarf star similar to the sun, although 10% brighter and 23% larger. Alpha Centauri B is a K1 orange dwarf star 90% the mass and 14% smaller radius than the sun. Proxima Centauri is an M6 class red dwarf star with 0.123 solar masses. Proxima Centauri orbits the AB pair at a massive distance of 15,000 AU or 0.24 light years, though it’s not completely certain it is a member of the system. Discovered in 2012, Alpha Centauri Bb was an extrasolar planet that was found in 2015 to be an artefact of data analysis. It doesn’t exist. In 2016, Proxima Centauri b was announced. It’s an extrasolar planet a bit larger than the earth, but is in the star’s habitable zone. It’s likely to be tidally locked, making life difficult to take hold. It’s also likely to be one of the easiest extrasolar planets to study in the near future because of it’s proximity. The Alpha Centauri system is estimated to be between 4.5 and 7 billion years old, around the same age of our sun or older. Due to Proxima Centauri being a flare star, life may never have a chance to become established on b because the flares may strip the planet of its atmosphere. Coming on Monday is the letter B, which will have a more biological topic. Comments are always welcome!